First things first, I want to clear up some common misconceptions about the Boston half marathon. 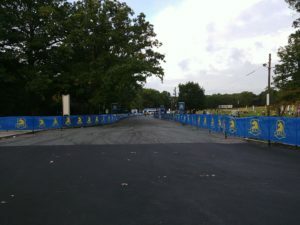 The half marathon course is NOT a shorter version of the full marathon course. Yes, they are both organized by the Boston Athletic Association, but that is where their similarities end. The half marathon does not require one to time qualify. There is a time cut off of 3 hours, meaning that your timing chip will “expire” after 3 hours, and you will be considered “DNF”, did not finish. 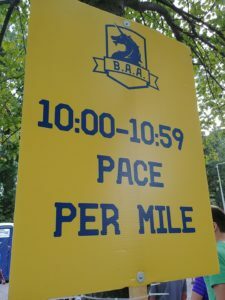 In order to qualify to run the full marathon, one has to run a race deemed as a “qualifying race” by the Boston Athletic Association and you have to finish in a certain time, according to your age and gender. To enter the half marathon, one is required to enter a “lottery”. The entry period was open for 48 hours, and entrants were randomly selected. It just so happened that the day that I discovered I was selected, was the day of my 35th birthday. Happy birthday to me, I get to race in Boston!! I asked one of my friends living in Montreal if he was willing to enter the race with me, and he said yes, so he also entered the lottery and was chosen. Hooray! That being said, while I do not want to diminish the lottery, this year, they opened up more available entrant spaces, so that more people could be chosen. I came to this realization because the entry link for the lottery was still working for a few days beyond when the original entry period had elapsed. I had gone from feeling lucky, to feeling like any other person who decided to enter a race. Everyone who entered this year, was chosen. I chose to do this race because it was the weekend before the Obstacle Course Racing World Championships in Ontario, and seeing I was already going to be on that side of the continent, might as well stack my trip as an awesome race vacation! I was so excited to do this race. To get the chance to race in Boston, a city with such rich history in its contribution to running as a sport. The Boston Marathon is where Kathrine Switzer trail-blazed women being permitted to enter races, in a time when women were still being told that running could injure our uterus and cause infertility. The science of women’s bodies and women’s rights in general, were greatly increased by brave women such as her. The half marathon this year may have even had more women registered than men! 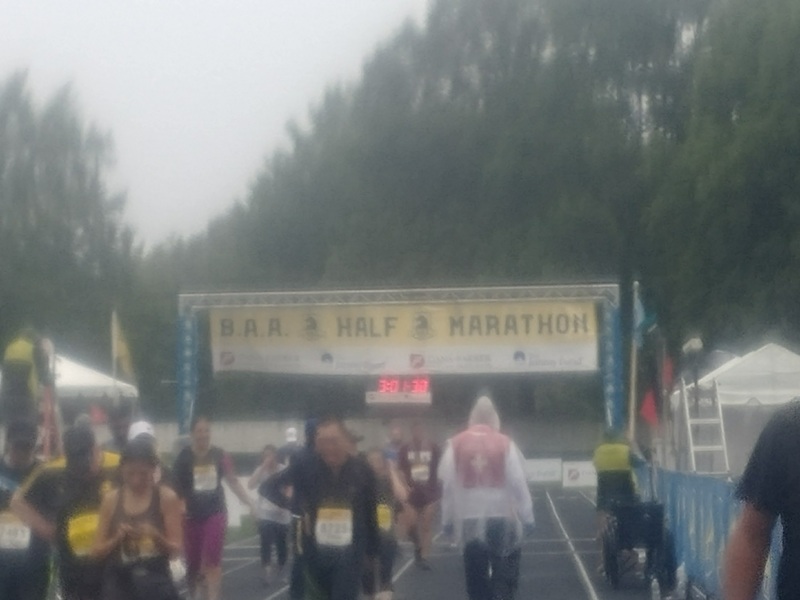 I followed the half marathon “beginner” training program, which began the week after our entries were accepted. The program included running 4 days a week, with 2 of the run days being adjacent to each other. 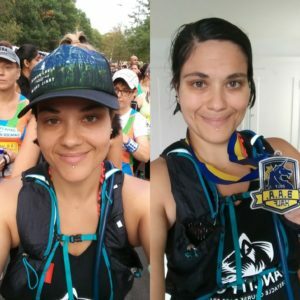 Knowing my body, running 2 days in a row was not going to work for me, and many of my friends who had trained for half marathons before said that running 3 days a week was completely sufficient. I did not follow the program to the letter however, as I was doing many obstacle course races during when I was completing this training program, so I adjusted the program accordingly; some weeks had fewer runs and some weeks had shorter runs, than I was supposed to be doing in those particular weeks. I felt as long as I could do the long slow distance run days, or the tempo days, that those were the priority runs to complete. I believe that I chose wisely. During my training program, I was learning about a new biomechanic stress that I had not experienced before. I was experiencing some numbness under the bottom inside of my left big toe. I learned that the problem resided in my left ankle’s reduced ability to dorsiflex, based on a bimalleolar fracture I had experienced 10 years ago. I spent a lot of time with my physiotherapist, who was very helpful in mobilizing my ankle. Even though we made tremendous progress and I did not have this problem during the half marathon, I also rolled my right ankle at the Spartan Beast in Seattle 3 weeks before the Boston half. Hooray, now I have a new injury! My physio could only help a little bit, I have to accept that I will (soon) need to rest in order for it to heal. The tendon of my tibialis posterior muscle insertion is super angry with me, and causes a burning sensation above my medial malleolus when I am running. Thankfully, it almost never hurts at rest or when I am walking. The starting gate, before it was loaded with people. Finally, the days were drawing near and I was boarding a plane to Boston. Race day came a couple days after my friend and I arrived. The energy of going to pick up my race packet, the energy of the race at the start line, I nearly cried as I ran out of the starting gate. If previous me had told me that I would run a half marathon someday, I would have shook my head and said “no way!” As I got further into obstacle course racing at increasing distances, I thought I would give it a shot. What better way to visit a new city than to run through a part of it, and Boston at that! A lot of people plan to run this race much faster than me! Some of my friends from my obstacle course race training club, Vancity OCR did warn me, though: “Running a (road) half marathon is WAY harder than running a Spartan Beast!” That notion didn’t quite make sense to me until I had completed both types of races. Now that I have, I can say that I agree with that sentiment. Even though my Spartan Beast took me twice as much time than the Boston half did, time is irrelevant during a Spartan Race. The terrain is always interesting, and doing the obstacles gives the brain something else to focus on. And if you are stronger than you are fast, like me, then getting a chance to redeem oneself in the obstacles in which one is good at, is very psychologically gratifying when one is becoming fatigued. Doing the road half however, my only job was to run. Just. Keep. Going. Seed by how fast you think you will go. My actual race was run slower than I had anticipated, even slower than my slowest pace. I was stopping often within the first hour to massage my tibialis posterior tendon. The second hour was okay, and I had wished that my race was finished by then. The last 5K took me a very long time. I was walking a large portion of it. The tendon pain had mostly subsided at this point, but it felt like the muscles in my leg were so engorged with blood, that merely lifting them felt like lifting bricks. Turns out, I am only strong when lifting things outside of my body! Lifting my own body was a struggle. The course was mostly flat and green, running through a part of Boston called the Emerald Necklace Conservancy. “Rolling Hills” was apt, and despite my heavy legs, I was able to run up those hills easier than I could walk up them. Training in Vancouver certainly helped me in this regard. Vancouver’s hills are far more intense! The route was out-and-back, but it didn’t feel repetitive. 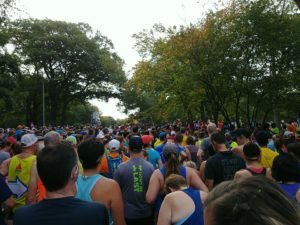 Some sections of the course looked familiar passing them a second time, but one stretch passed on the opposite side of a lake, and we had a long portion through a park and past a zoo before ending inside of a track stadium. I have to say, seeing giraffes with only a kilometre and a half left filled my brain with something positive when I was tired and grumpy. I can understand why this race draws many people year after year. The weather was interesting, definitely not boring. It began as a warm and humid day, which then turned into gentle rain, followed by a little sun, and then a harder downpour. Before the race in the start corral. After the race, inside somewhere not raining. At many of the significant distance markers, there was a clock counting how much time had passed since the first person crossed the start line. Since we had a staggered start according to our expected pace, the time on the clock was not the same as my race time. Even though I knew this, as I saw “2:59” at the finish line gate, I sprinted as fast as I could in the last 100 metres, just in case my timing chip would expire! I finished in 2:50:30, much slower than anticipated. My fastest pace would have had me finish in 2:27 and my slowest pace would have had me finish in 2:48. I knew that I would be closer to my slowest pace for that kind of distance, but I did not expect to spend so much time walking. The biomechanic discomfort was beyond what I had expected. Surprisingly, none of my joints or any of the common areas hurt; I had no back/hip/knee pain, nor any nerve pain or muscle tightness, beyond my calves which hurt after all runs of any distance on all terrain. After the race that evening, all of my lower body tightened up and walking was very uncomfortable. That being said, the next day, only walking down stairs was uncomfortable. Forcing myself to do a lot of walking after the race, and the day after the race seemed to speed along my recovery. All of this increased my race and training experience. Next year, I would like all of my races to be obstacle course races or trail races. If I do another road race, it has to be something really special. Like, a Ragnar Relay.